Since catching a couple of decent bass on live mackerel recently I've had a number of emails asking about my tactics and particularly the 'rig' that I used. Now rigs seem to be an 'in thing' these days and I notice that the tackle shops and magazines are full of ready-tied rigs. Of course this is particularly the case with carp angling where hairs, helicopters and other gadgets are now legion. In sea angling circles, in the past, you either used a float, a leger or a paternoster the rig business has now got a grip. It's possible, if you are so inclined, to buy ready made wishbones, pulleys, bombers and pennels with bait clips and grip leads in abundance. Of course each of these refinements may have its place - I'm certainly not qualified to say whether they improve catches in certain branches of the sport. However, I can't help thinking that it's all a bit too complicated." Of course the truth is that I'm mean (= tight) when it comes to tackle. I was brought up in the Richard Walker school of tackle where you tie on a hook and unless you REALLY NEED some other item (float, lead, swivel, trace etc.) leave it at that. The thought of leaving two or three quidsworth of swivels, beads, clips and links on the sea bed every time I cast out fills me with dread. " ----but you often use lures worth ten pounds or more!" I hear you say. Yes, that's true but I have no intention of letting them get hung up on the sea bed. Most of my lures are floating shallow-divers or surface poppers and losses, while not impossible, are vanishingly rare. 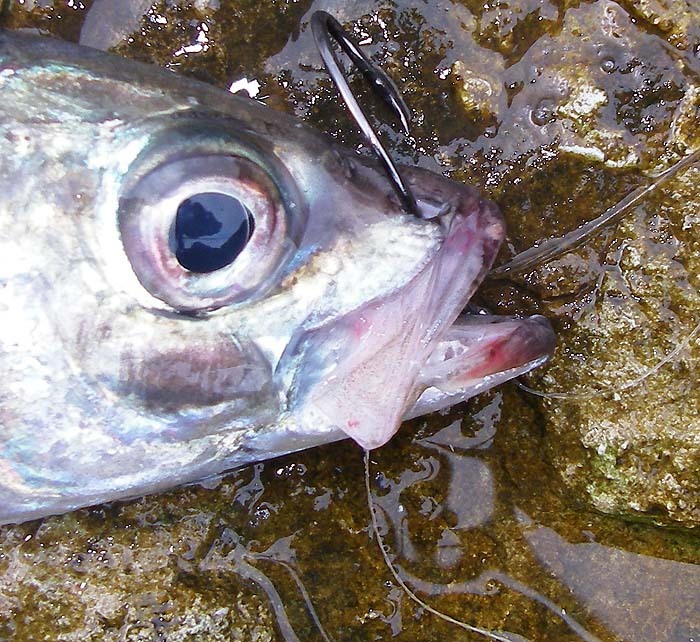 To return to the livebait rig I simply use the same tactics that I have employed for piking for many years. This has been refined, by trial and error, to minimise the paraphernalia attached to the line (which might scare or deter fish), to maximise the chance of hooking fish and the reduce the likelihood of 'deep hooking' or injuring my catch. In the sea off Dorset, when I'm after bass, I don't need a wire trace because the chances of hooking fish with sharp teeth are small. I don't need lead because the water is shallow and many bass are close in and near the surface (there are usually some there at any rate). 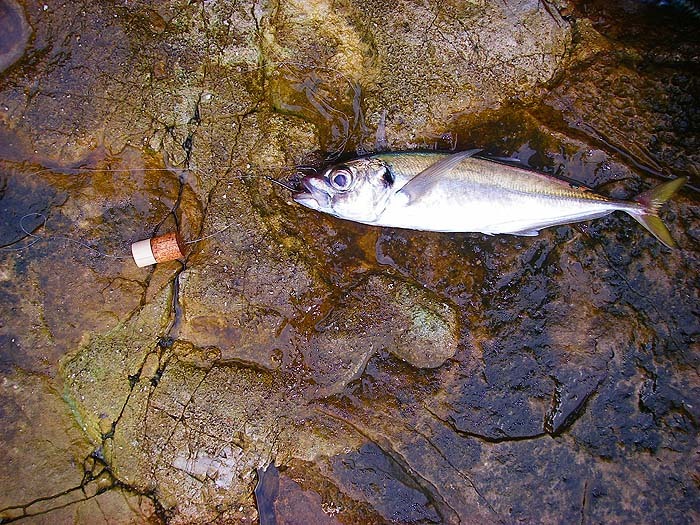 I could get away without a float but it helps me to keep track of the bait and may stop it diving to the bottom so I attach a wine bottle cork slit with a razor blade (I do exactly the same for pike - it's cheap and effective). The only remaining question is the hook. Now this is a bit trickier. 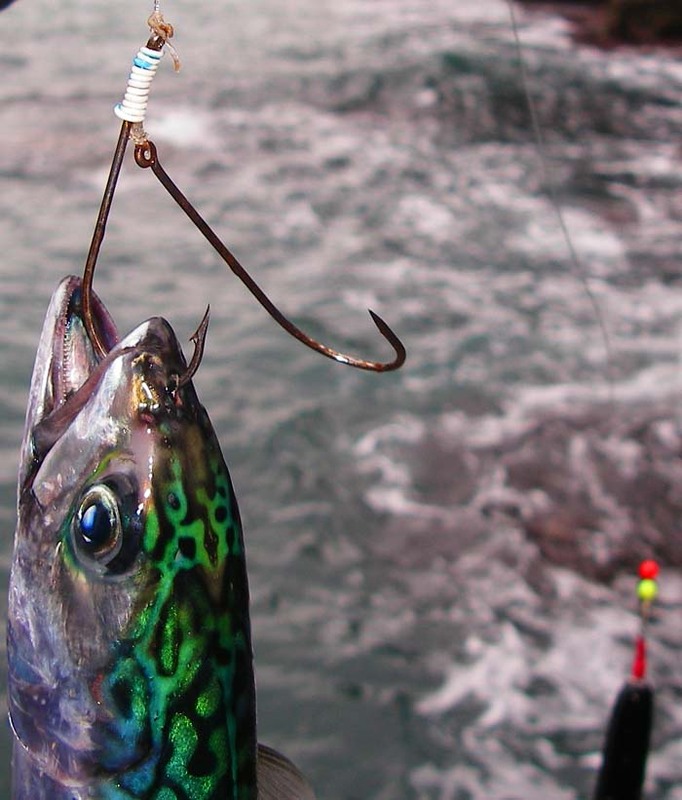 For piking I lip-hook the bait with a 4/0 circle hook and this seems very good so I started off doing exactly the same thing with live and/or dead baits for bassing (now upped to a 6/0 for mackerel sized baits). It appears to work well in that I'm not missing many bites but I'm long enough in the tooth to know that my method may not be the 'last word'. I know that my pal Stuart Clough is successfully using similar tactics (smaller hook size) for perch and he tells me that he quite often lands accidental pike even without the wire trace. However, Nigel, who often fishes with me for bass, is trying a form of Pennel rig with J hooks and the late John Darling, who caught lots of big bass on livebaits from his boat, used a large treble hook. For the moment I would say that the jury is out on the matter of hooks. The only thing in favour of my tactics is that the fish are almost invariably lip-hooked and can be returned unharmed unless they are wanted as food. Any comments on the subject would, as usual, be welcome.